Contact us for professional Snake removal, control, and clean-up services. We also offer coaching services and products for a fee. If you're a do-it-yourselfer, check out the suggested techniques below. Why do we want to keep Snakes Around? Snakes play an important part in the natural environment and are irreplaceable in their role on the food chain. Snakes are one of the key predators when it comes to controlling rodent and insect populations; these creatures are some of snake's favorite meals. Snakes are one of the most feared animals on the planet due to their odd features and sometimes deadly venom, but people forget that the poison snakes inject into prey is also being used to develop many new medicines that are used to treat several very serious medical conditions. Why do we get rid of Snakes? 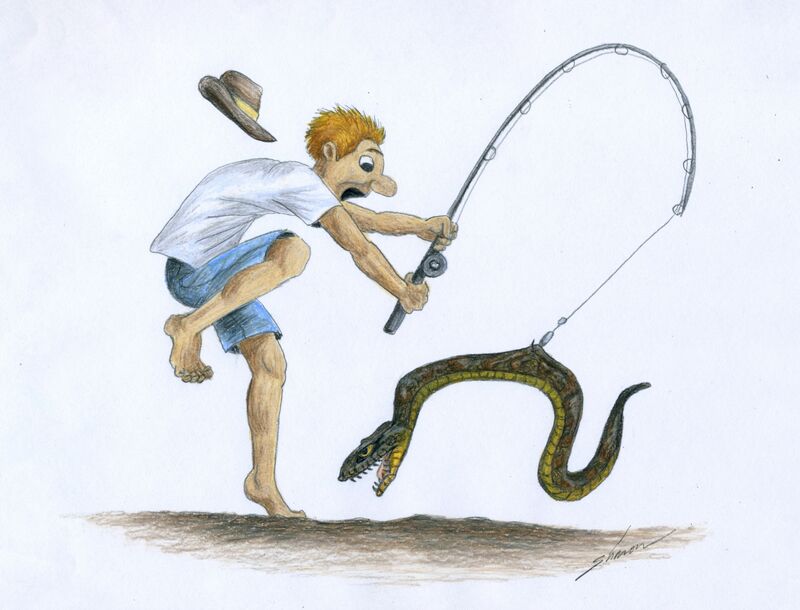 The main reason that people want to get rid of snakes is because of the bad rap the poisonous snakes have made for all species even though most snakes are nothing more than a large noodle with teeth. While only about 1/3 of the snakes in the US are venomous, people are still scared of the entire species as a whole. The four types of snakes that are poisonous in the US are the Copperhead, Cottonmouth, Rattlesnakes, and Coral Snakes. The next reason to want to get rid of snakes is because of the chance that they carry something dangerous besides poison; snakes and other reptiles can carry various strains of Salmonella, Tuberculosis, and Campylobacter. These illnesses can cause serious sickness and even death. The last reason (that we have) for wanting to get rid of a snake(s) is because of the serious phobia of snakes called Ophidiophobia. This phobia can cause symptoms as mild as anxiety and fear, or as extreme as trembling, fainting, and avoiding any area where you might encounter a snake. While snakes die and rot just like any other animals, dead snakes smell differently and can even smell worse! Dead snakes should be picked up with rubber gloves and a shovel, then placed in a plastic bag and taken to a burn plant to be incinerated. If there is a snake problem in your area being caused by an infestation from city/county property, you may be able to refer us to the city, county, or state so that they can hire us to remove the problem. If a snake is dead on city property like a road or other, the city itself should be contacted for removal. We do not remove dead snakes off of city, county, or state properties unless hired to do so by responsible city/county authorities. Many times, people will kill snakes without question or consideration. The problem with this is that snakes play a huge role in the food chain. Snakes are much more beneficial to the environment when they are alive and allowed to hunt and fight against rodent and insect populations. All snakes, even poisonous ones, would prefer to avoid contact with humans. Killing them could mean that animals like voles, gophers, mice, rats, and others rodents that carry the Hantavirus, are free to populate and get into and contaminate whatever they like. It is up to you whether you kill a snake or not, just be sure to check your local laws before taking any form of lethal action. If a snake is without a doubt venomous, it can be safer to kill it rather than risk a family member or pet being bitten, but don't discount its benefits before you do. It isn't a heavily guarded secret that people are afraid of snakes and don't want them anywhere near, but we also want to get rid of snakes to prevent bites. While harmless snakes have a bite that feels somewhat like a pinprick, venomous snakes like Copperheads, Cottonmouths, Rattle Snakes, and Coral Snakes have the ability to down a fully grown man. We find that snakes come out of their dens as the weather starts to warm up. They hibernate during the winter because of the extreme decline and slowing of their metabolism as the temperature drops. The best time to get rid of snakes is almost up to you. If having snakes around your home is out of the question, a "no can do" then you should get rid of them as soon as you find them around. If you suffer from Ophidiophobia, it's probably best that you contact one of the technicians on our site. If you are okay with snakes, as long as they're not poisonous and don't pose a threat, and you are appreciative of the help that they are, then there may be no need to get rid of them at all. Getting rid of snakes is a unique, complicated process because there are many styles of traps that are helpful. We sell special traps and snake lures that help to make this process easier; these products have a natural chemical makeup and/or live bait. You can control snakes by controlling their environment, snakes follow prey and will move to the same lush areas that they do (especially during dry seasons and/or drought). Knowing this is important because if you have a snake problem, killing them could mean you're going to have a rodent problem soon, too. Grasses and foliage should be kept low and trees and bushes should be kept high so that snakes can't climb over or under them. By taking away any rodents and insects (food sources), snakes are less drawn to the area and won't cause as much conflict. If you control the habitat, you control the snakes. We can also install Snake Guards around the perimeters of properties. These Snake Guards are about 3-4 feet and are applied around the entire area making snakes unwilling to cross the perimeter. Snakes do not like to climb on sharp things that will cut their underbelly making this method very effective. Snakes hide in many areas like under concrete, under crawlspaces, under debris (firewood, trash pile, haystack, etc. ), under old cars, and beneath any other area that offers protection. Snakes can be found almost anywhere as long as it is a safe, tight cranny where they can live without disturbance. Snakes will hide under heater registers and inside of venting and dryer vents, they love to be in areas where they can control their body temperature; this means that they will be able to find shade and cool down or get to an open, warm spot when necessary to maintain their preferred 20-30°C. Snake entrances can be opened up by woodpeckers, squirrels, rats, raccoons, and other critters. Any hole that a snake can get in, it will get in; this means you may have to be searching low AND high for the entrance since snakes are excellent climbers. Repair whatever area where the snake den entrance was found with building materials like wood, brick, or stucco (whatever the material was originally) and add strong metal to prevent reentry. Be careful not to block a snake inside of its den, this will often drive them deeper into a home or building, this is why we prefer exit traps. Snake feces, look much like regular feces though they can be mistaken for bird poop in that they can also contain the characteristic white urea. Snake droppings may also contain bones and/or feathers from whatever it was recently eating. The size of the poop can almost tell you the size of the snake. The bigger the dropping the bigger the serpent. The waste can also help indicate what kind of snake you might be dealing with (if you're willing to dig around in it and investigate its contents). Snake droppings can contain bacteria for Salmonella and other diseases, this means that you should thoroughly wash your hands and wear gloves and masking when cleaning the feces. Any waste collected should be taken to a burn plant and incinerated. Snakes have the ability to climb and slither up trees, rough siding, and brick and will move from there into holes where they can access attics. They can also go through venting systems from here where they can have access to warm dry air when they want. You will need snake traps or specialty snake vent systems to get them out. You should also take precautionary measures and keep tree lines trimmed 6-feet or further from your roof line and shrubs should be kept low to the ground. If you are having problems with snakes climbing up the side of a wall, we do sell a product called 'Snake Guard' that will prevent any animals from climbing anywhere. Snakes will use any access they have to a roof to find somewhere where they can have access to hot and cold air to be able to maintain their internal temperatures. Sometimes, snakes will crawl up onto a roof and down through a chimney to gain this access. Snakes will usually have to be removed by hand or with special snake traps in this situation, this is best handled by one of the technicians on our site. To prevent a snake, or any other animal, from having access to your chimney, you should invest in a well-made chimney cap. Snakes can get into houses through pet doors, holes, open windows, open doors etc. They don't need a very large hole because they are capable of flattening themselves and making their bodies thinner. Pets will sometimes bring them in as well. Snakes in a home should be baited and trapped as soon as possible, though this can prove difficult since snakes don't eat on a regular basis. When snakes get lost in walls, it is common to have to cut open the wall and pull the snake out by hand. You might also be able to use a live bait (rats, mice, insects, etc.) to draw the snake into the open where it can be caught and put into the proper containment. Snakes in walls can be a very difficult process and should be handled by a professional. We have technicians that are ready and willing to help in your area. First off, you should make sure you have vent covers, with very small holes, on ALL of your vents to prevent any animals from entering your home. Snakes, rats, mice, and other creatures are more than willing to use any hole provided as an entrance to your house. You will have to set up traps and one-way vents to get rid of snakes inside of venting systems. Again, make sure that trees are trimmed at least 6-feet away from your roof line and that shrubs are kept low to the ground. If the snakes are crawling up the side of the wall, we have a product available for purchase to help prevent this. Snakes on a roof will need to be trapped and removed which can be very dangerous due to the heights (people get jumpy around scaly creatures). It is also likely that the snake(s) is just using the roof to sun itself and may leave soon, keep watch to see if it has a den on the roof or even access to an attic. This may pose an entirely new problem. Snakes will den underneath these areas because of the warm protection that is provided. The issue with this is that, especially if it's a venomous snake, they may strike out at someone stepping over them. The plus side to a snake outside is that they can help to control rodent and insect populations. We do sell a special snake vacuum trap that allows the snake to leave and not go back underneath, it's similar to an exit trap which we sell as well. Snakes on a property are a very personal thing when deciding how to get rid of them. Snakes follow prey, and if you're having problems with snakes it is likely that there would be a vermin problem without the snakes. If you would rather deal with the rodents than the serpents, then you may be able to trap, kill, or relocate snakes (check your local laws). We also sell a product called 'Snake Guard' that doesn't allow snakes to access the area. We use this product to prevent snakes and other animals from climbing trees, walls, power poles, fences, and other materials. Another unique way to get snakes off of a property is with loud noise and disruptions. Like every other animal on the planet (including people), snakes like quiet places to live meaning that an abundance of sound could do the trick. Snakes will get into a crawlspace and then crawl through walls to make their way to a warm area in the home like a laundry room or near a fireplace, or even into a cool area like a basement or an attic. Repellent should NEVER be used in a crawlspace, instead use traps, one-way vents, or snake vacuum traps. Either tip the garbage can or dumpster over so the snake(s) can crawl out, or install a low pitched ramp like a rough 2x6 or 2x12 piece of wood at a slight angle so that the snake can use it to climb out. You can also use snake tongs that are about 4-6 feet long to pick up the snake; these help you gain better control of the snake while you are handling it. We will use live mice or rats to lure snakes into a trap, though this can be tricky since snakes don't regularly eat. Once a snake is recaptured, we recommend that you keep them locked up tight. Never let a snake get loose, they will crawl into any holes and can gain access to walls and other areas and may get lost. Often times, pet snakes escape and get lost in a structure and then die, which makes for an even more difficult removal. NEED HELP GETTING RID OF SNAKES? If you are having problems, or don't want to deal with the snakes yourself after reading this article, please give us a call at 1-888-488-7720, you can also contact us through email. You can also call one of the technicians from your area and they can help you figure out a solution. REMEMBER: Snakes can be dangerous and working with them can be very complicated; it's best to hire a professional. Check out our YouTube channel and our website, AllstateAnimalControl.com, or use other Google resources to help you solve your problem. We do offer coaching solutions. Please send digital photos of your problem and we can coach you over the phone and ship you products for a fee.